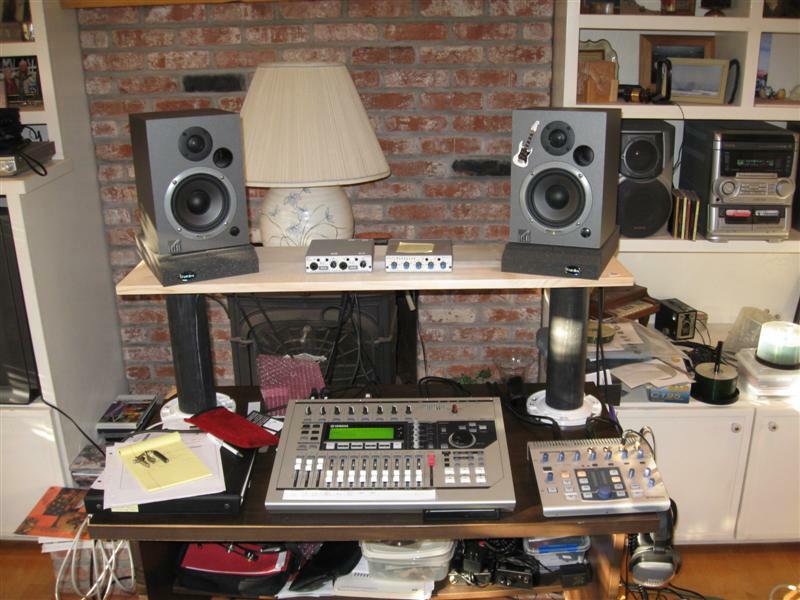 When I was living in a permanent place, I had a nice studio desk with raised platforms for the monitors. However, in my "every 6 months" place I've only been using a small desk with the monitors at the same level as the recorder. I did have them angled up some towards my head. Got tired of it and came up with the attached idea. The shelf supports are 3" PVC pipe. The attachment fixtures on the desk and shelf are what are called "closet flanges" in the plumbing department of the hardware store. Actually, they are used to mount a toilet to the floor! Hope they don't make my music sound like ..... well you know. I'm pretty happy with the way it worked out and it looks pretty good, too. Would look better if I painted the shelf, but I'm not going to worry about it. are the tweeters about level with you ears now? I seem to be looking more at the center (or maybe slightly below) of the woofers when sitting in my chair. I tried to measure my "sitting ear height" by myself and got 45". Someone is coming over tomorrow to record and I'll try to get an accurate measurement. I kind of forgot about the new foam pads I got for the speakers. They raise the speakers 2", so I'm a bit higher than planned. Are the tweeters supposed to be at ear height? I probably couldn't tell the difference. Easy enough to adjust the height downward by cutting the pipes, though. Just for grins . You might try turning the monitors on their sides placing the woofers to the outsides. That's the way I have my Tannoys in the other room. MSG: Good idea. I'll give it a try. I don't think anything will leak out. Mine seemed to have better definition w/tweeters inside both angled to the center of my thick head. Are those Event 20/20's? Mine sounded good until I killed 'em. I just Febreezed my Fro!.....it smells GREAT!!!! They are Events, but the PS5 model. I like them. BTW MSG, I turned them on their sides and I think I'll leave them there. Thanks for the idea. You're welcome Ralph , I like my Tannoys placed that way although they recommend them upright.